Just about a week ago I was in France enjoying the country, food, wine and its culture. 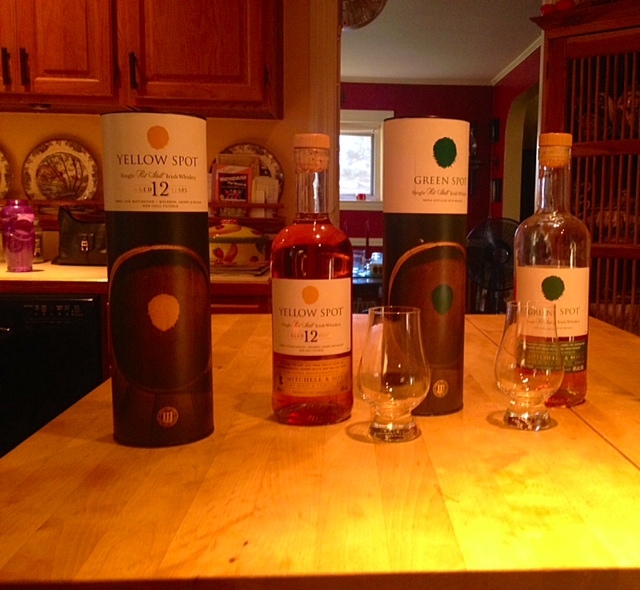 It was extremely hard to come back stateside but, there was one thing I had to do before leaving Europe and that was acquiring a bottle of the Irish whiskey Yellow Spot. Lucky for me, our connection flight back to the states was via Dublin. You see, Yellow Spot is not sold in the US so I had to make sure to get it while I was there. My first introduction into this brand was not with Yellow Spot but rather its sibling, Green Spot while I was in Ireland last year. At the time of my 2013 Ireland trip, Green Spot was not sold in the US so I brought a bottle over to give to my boyfriend as a gift. My regret, not bringing a bottle for me! Green Spot is like no other Irish whiskey I have ever had (http://wp.me/p3Zt2k-9). Unlike Yellow Spot, neither I nor you, have to travel to Ireland to acquire a bottle of Green Spot anymore as it started selling in the US this past March. Yellow Spot and Green Spot are both by Mitchell and Son. Mitchell and Son began their business as a bakery in 1805 and that eventually evolved into their current business as wine and spirits merchant. The Green Spot and Yellow Spot brands are produced exclusively for Mitchell and Son by Irish Distillers at the Midleton Distillery. What you have to understand is that I wanted to get Yellow Spot, even though I had never tasted it. The reputation of Mitchell and Son was enough for me to know that it would be a great product no matter what. I was certainly not disappointed when I did enjoy a dram. 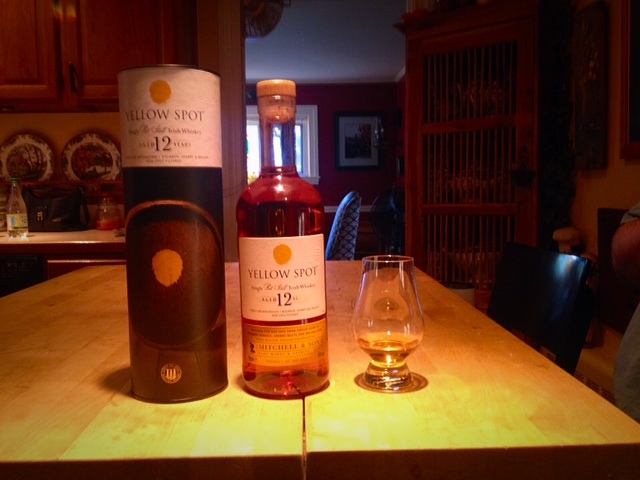 This Yellow Spot second edition is matured for 12 years and matured in three different oak casks, American bourbon barrels, Spanish sherry butts and Spanish Malaga casks. The original Yellow Spot was last bottle in 1950 before its current introduction. I never tasted the original Yellow Spot but I will tell you this current Yellow Spot is absolutely fantastic. Taste: Honey, but this whiskey has a nice bite to it. I get notes of spices and wood. Finish: Slight burn with a long lingering taste. I could wait 5 minutes before my next sip and I could still taste the whiskey. Out of the two brands I think Green Spot is smoother but they are both equally great in my eyes. Green Spot is the smoothest Irish whiskey I have had as of yet. Yellow Spot is also smooth but different. There are different qualities in both brands that you come to love and appreciate. The price for Yellow Spot was 51 Euros, while you can get Green Spot here in the states for about $49. $49 for an amazing, smooth Irish whiskey is a no-brainer. I highly recommend trying both and hopefully you are now running out to get it! If you’ve tried either one of them I would love to get your take on them. Great post, I enjoyed green spot very much! now I have to look for the yellow one and give it a taste!